Yes, you need to submit rent receipts if the total rent that you declare for full year (12 months) is more than INR 1 lakh. No rent receipt required for rent less than 3 thousand per month. Just HRA declaration is enough to claim tax exemption. Each month’s Rent receipt required for rent between 3001 to 8333 per month. Each HRA rent receipt should have 1 Rupee revenue stamp along with landlord’s signature. You are paying rent more than 1 lakh per year which makes it about INR 8,333 or more per month. Rent receipts : Each month’s Rent receipt required. Each HRA rent receipt should have 1 Rupee revenue stamp along with landlord’s signature. Landlord’s PAN number is mandatory. Landlord Declaration: Write the reason for NOT having PAN on plain paper with Landlord’s address, phone number. Form 60: Ask your landlord to fill this form 60 and submit it with your HRA claims. If the landlord is NOT sharing his PAN number for your HRA tax claim, then you are out of luck and cannot claim HRA. Is Rent Agreement Required for HRA exemption? 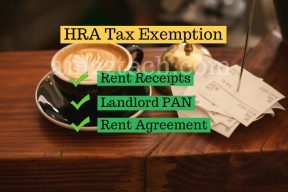 Rental Agreement is not mandatory for claiming HRA tax exemption but rent receipts are required. I strongly recommend to have a rent agreement in place if you are paying rent to your wife or parents as it helps prove the landlord-tenant relationship. In case of renting with other friends like a shared flat, I recommend to have rent agreement to clearly show the amount of rent shared between tenants. Some people do create fake rent receipts and try to claim HRA tax exemption. Fake rent receipts can be caught by Income tax officer and you may have to pay penalties along with due income tax. HRA rent paid proof is not required but can be requested by income tax officer if they have suspicion on your rent receipts. The best proofs are rent paid using bank cheque or online money transfers to landlord’s bank account. If you are paying rent of 50 thousand or more per month, then you have to deduct tax at source (TDS) @ 5% from the rent paid to your landlord. You will have to pay the TDS penalty if you do NOT deduct TDS which is interest at 1% per month. This penalty increases to 1.5% per month where TDS is deducted but not deposited with Income tax office. The penalty of Rs 200 per day is added to interest if the TDS deposit is delayed.